The Great Parchment Book is the centrepiece of the current display in the City of London’s Heritage Gallery at Guildhall Art Gallery until 10 August 2017. Visitors have a rare opportunity to see three original folios from the Great Parchment Book at close quarters, showing in a striking display the extraordinary 3D nature of the surviving distorted pages of the manuscript affectionately known as the “poppadum book”. 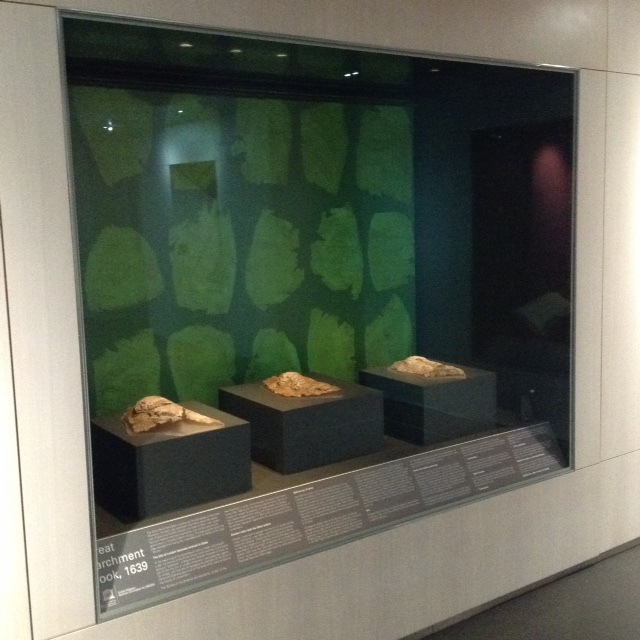 The pages on display ( CLA/049/EM/02/018/Q6, Q11, Q12) relate to the Natives’ Lands, the estates granted to those who were Irish by birth. Landholders mentioned include Ferdora, Shane and Brian O’Cahan, gentlemen. The O’Cahan clan had been the chief sub clan to the O’Neills, Kings of Ulster. The majority of the clan chiefs had fled in the 1607 Flight of the Earls after the defeat of Hugh O’Neill. It was “O’Cahan’s Country” which had been confiscated by the Crown and then assigned to the City of London for plantation. Thirteen freeholds were allocated to the native Irish across the new county of Londonderry. The lands mentioned in the displayed pages lie within the Ironmongers’ and Grocers’ Companies’ proportions. They record that Ferdora O’Cahan is instructed to erect a substantial house “after the fashion and manner of an English house” on his estate. It is also notable that settler Robert Downs is required “to keep in readiness upon the premises for the service of his Majesty … one musket” whereas none of the O’Cahan’s are instructed to do so as the intention was to muster forces to counter the threat from the native Irish. 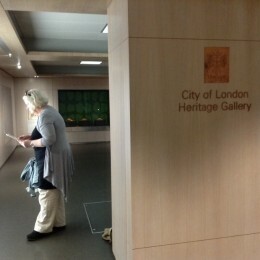 For details of the display and how to find Guildhall Art Gallery, please visit the Heritage Gallery web page. The Great Parchment Book has been designated City of London Treasure of the Month for May 2017. On Wednesday 31 May 2017 Historic England launches the first ever London History Day, celebrating the capital’s extraordinary history and heritage. London Metropolitan Archives will mark the day as part of a series of celebratory events this year in connection with the 950th anniversary of the City of London Corporation’s extensive archives. As part of London History Day, there will be a curator’s talk on the Great Parchment Book in the Heritage Gallery at Guildhall Art Gallery. The talk is at 10.30am on 31 May in the Heritage Gallery and is free, but please book on Eventbrite to secure your place. For more details of what’s happening at LMA on London History Day, also see Eventbrite.